Jesus H Christ. 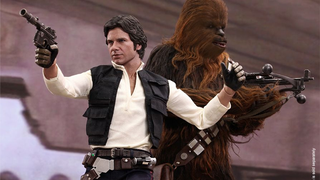 We knew it was going to be good when Hot Toys revealed they'd purchased the Star Wars License a few months ago, but today's revelation of the first two 1/6th scale figures of Han Solo and Chewbacca have finally shown us how good. Get ready to reach for those wallets. Each figure (unfortunately Hot Toys haven't revealed a two-pack akin to what they did for Rocket and Groot from Guardians of the Galaxy recently) will be available in Q1 or Q2 of 2015, so whilst we'll be waiting for a while, there's plenty of amazing pictures for us to ogle at for now. Each figure comes with 30 points of articulation, and multiple accessories - Han with his trusty DL-44 Blaster, a second sculplted headpiece with the Millenium Falcon's headset attached, a variety of hands (including versions with or without gloves), and in a special edition set, a Stormtrooper blaster rifle and belt to match his look from escaping the Death Star in A New Hope. Chewbacca, who looks incredible with actual material used for the figure instead of sculpted fur like many have done in the past, comes with the bare necessities - his Bowcaster, Bandolier and satchel, as well as a Falcon headset like Han's, and a set of normal hands to pose him without his weapon at the ready. There's no prices been revealed for these yet - Hot Toys tend to retail anywhere between $170 and $230 - but my word, the moment we know that, I'm preordering these two beauties. I mean, just look at them.